There is speculation hovering around of the new name of Royal Caribbeans third Oasis class cruise ship. The vessel which is still under construction at the STX shipyard in St. Nazaire, France is set to makes its debut in April 2016. The name of the ship is yet to be officially revealed but apparently Captain Trym Selvag might have already accidentally revealed its name. the captain was hosting a Crown & Anchors event onboard Oasis of the Seas when he mentioned the name would be Harmony of the Seas. Royal Caribbean will announce the ships name in the coming weeks and over the months further details will be revealed. 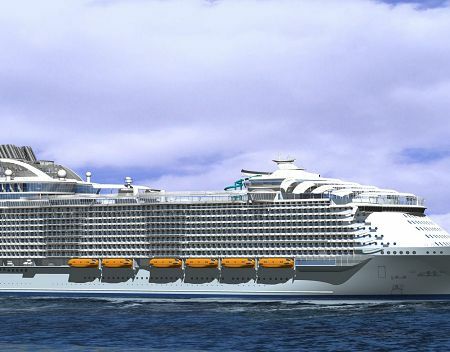 The third Oasis class ship will be slightly larger than Oasis and Allure of the Seas at 227,700 gross tons. Other potential names of future Royal Caribbean ships include Apex of the Seas, Emblem of the Seas, Joy of the Seas and Spectrum of the Seas.